Radon is a cancer-causing natural radioactive gas that you can't see, smell, or taste. It is a large component of the natural radiation that humans are exposed to and can pose a serious threat to public health when it accumulates in poorly ventilated residential and occupation settings. According to the EPA, radon is estimated to cause about 21,000 lung cancer deaths per year, second only to smoking as the leading cause of lung cancer (EPA 402-R-03-003: EPA Assessment…,2003). An estimated 40% of the homes in Pennsylvania are believed to have elevated radon levels (Pennsylvania Department of Environmental Protection, 2009). The worst-case scenario for radon exposure would be that a large area of tightly sealed homes provided residents high levels of exposure over a prolonged period of time without the residents being aware, leading to a large number of people with cancer attributed to the radon exposure. Radon exposure is inevitable given present soil, geologic, and geomorphic factors across Pennsylvania. Development in areas where previous radon levels have been significantly high will continue to be more susceptible to exposure. However, new incidents of concentrated exposure may occur with future development or deterioration of older structures. Exposure can be limited with proper testing for both past and future development and appropriate mitigation measures. Overall, the probability of future radon exposure hazards is considered likely. 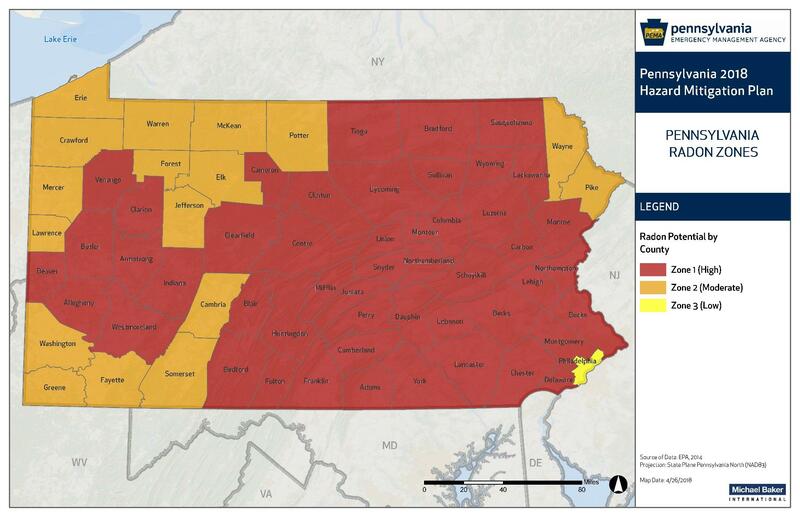 Radon hazard zones in Pennsylvania. Unadjusted median basement radon concentrations in PA by geologic unit, 2006-2013. (Casey et al, 2015).